David Lyons is a combative No.8 who plays for the Scarlets. The Australian forward made his debut for NSW as 20-year-old in2000. He went on to make 83 consecutive appearance before a knee ended that record-breaking run. Lyons signed a four-year contract with the Scarlets at the beginning of the 2008/09 season and made his debut for the Welsh side against Bath. 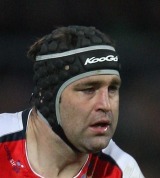 In his first season he started in all 30 of the Scarlets' league and cup matches and was made captain for the 2010/11 season. He has played 44 times for Australia following his debut in 2000 and also represented the Barbarians.